Laquan McDonald’s great-uncle says that although it’s a partial victory that the former Chicago police officer who killed the black teen received any prison time, it’s still a sad day for the country and its justice system. The Rev. Marvin Hunter said Friday after Jason Van Dyke was sentenced to nearly seven years in prison that the case sends a “strong message” to other police officers that they can and will go to jail if they’re caught lying or breaking the law. However, Hunter says Van Dyke “clearly committed murder” and that footage of him shooting McDonald 16 times has been shown all over the world. He says anyone with a conscience knows it was murder and that legal changes are needed. Van Dyke was convicted of second-degree murder and 16 counts of aggravated battery — one for each shot. Jason Van Dyke’s lead attorney says the former Chicago police officer “truly felt great” and “was happy” with the nearly seven-year prison sentence he received for fatally shooting black teenager Laquan McDonald. In Illinois, judges are typically required to sentence defendants for the most serious crime for which they’re convicted. Judge Vincent Gaughan’s decision to sentence Van Dyke on the second-degree murder charge instead of the 16 counts of aggravated battery was a huge break for the former officer. Had he been sentenced for the battery counts, Van Dyke would have had to serve 85 percent of his sentence. He also says it was a “historical case” and that he believes the system worked. A relative of Laquan McDonald says he doesn’t think the sentence for the police officer who killed the black teen is sufficient. The Rev. Marvin Hunter said Friday that Judge Vincent Gaughan’s sentence of six years and nine months in prison doesn’t do his great-nephew justice. Activist William Calloway said 81 months “is a slap in the face to us and a slap on the wrist for him,” referring to the defendant, former Chicago police officer Jason Van Dyke. Former Chicago police officer Jason Van Dyke didn’t react when he was sentenced to nearly seven years in prison for the 2014 killing of black teen Laquan McDonald. Van Dyke sat still and blinked as Judge Vincent Gaughan sentenced him Friday to six years and nine months behind bars. His wife, Tiffany Van Dyke, also didn’t react, but others in her row in the courtroom gallery showed relief. Before handing down his sentence, Gaughan said the shooting had affected both McDonald’s and Van Dyke’s families and that he assumed that “100 percent of people will be disappointed” with his decision. Judge Vincent Gaughan’s sentence of six years and nine months in prison Friday came a day after another judge acquitted three other officers of trying to cover up the shooting to protect Van Dyke. The case went largely unnoticed until the city was forced to release police dashcam video 13 months after it happened. The video sparked large protests and led to the ouster of Chicago’s top police official and some department reforms. The former officer didn’t testify before a jury convicted him in October of second-degree murder and 16 counts of aggravated battery — one for each time he shot the black teenager. 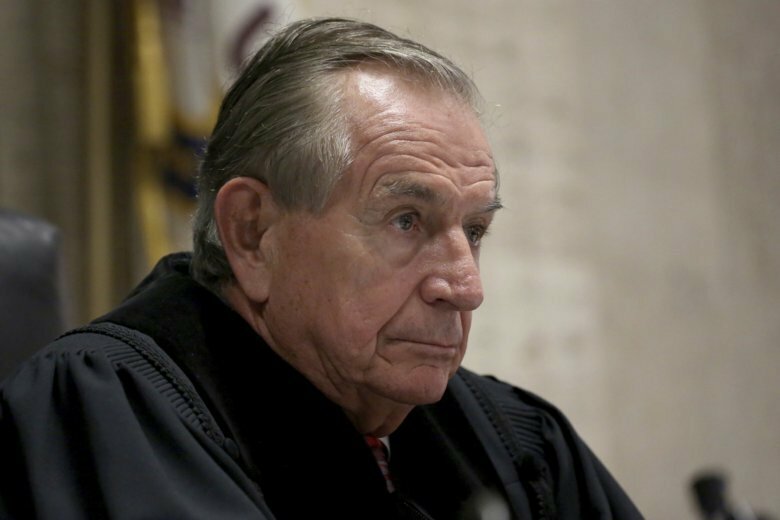 Special Prosecutor Joseph McMahon said Friday while summing up the state’s case that Van Dyke’s 2014 shooting of the 17-year-old has been “devastating” not just for Chicago but for the entire nation because it has further deepened the public’s distrust in the police. Defense attorney Darren O’Brien asked the judge to sentence Van Dyke to probation. He said the murder charge allows for probation and that this case “screams out” for such a sentence. Prosecutors and defense lawyers called more than a dozen character witnesses during Friday’s hearing, including McDonald’s great-uncle and Van Dyke’s wife and 17-year-old daughter. The former officer’s family members said he’s a good father and husband who isn’t hate-filled or racist. Jason Van Dyke’s wife says her life has been “a nightmare” and has been turned upside down since the former Chicago police officer’s murder conviction in the 2014 fatal shooting of black teenager Laquan McDonald. She echoed other family members who testified that her husband isn’t racist or full of hatred. Jason Van Dyke’s family members are trying to humanize the former Chicago police officer during his sentencing hearing for the 2014 fatal shooting of Laquan McDonald, saying he’s a good father and husband who goes out of his way to help and who isn’t racist. Van Dyke’s sister, Heidi Kauffunger, told the court Friday that her brother has been abandoned by family and friends since he was charged. She says he was even contacted by someone who said Van Dyke had mistakenly been invited to a wedding and that the family didn’t want him there because “it would take attention away” from the bride and groom. Kauffunger begged the court for mercy and said if her brother goes to prison the family “will lose everything.” She says Van Dyke’s two daughters have been bullied and that the older one even had the words “16 shots” written on her school desk. Jason Van Dyke’s brother-in-law says the former Chicago police officer is a “gentle giant” and isn’t the “monster” or “racist cop” that he’s been portrayed as by the media. Keith Thompson said Friday at Van Dyke’s sentencing hearing that Van Dyke has always treated people fairly. Thompson, who is black and whose wife is the sister of Van Dyke’s wife, said he has never seen anything to indicate that Van Dyke is racist in the 13 years he’s known him. Kaylee Van Dyke told the court Friday that she wrote a paper for her high school civics class about “the harsh reality” of police work. She said police officers don’t care about people’s color, “they care about your safety.” She also said she regrets all the times she didn’t hug her father. A prosecution witness at the sentencing of the Chicago police officer who killed black teen Laquan McDonald wasn’t able to identify the officer in the courtroom, so he wasn’t allowed to keep testifying. Alberto Luces was one of several men who testified Friday about run-ins they had with Officer Jason Van Dyke during traffic stops. Luces, who is deaf, said through a sign language interpreter that he was pulled over by two officers, one black and one white. But when asked to identify the white officer in the courtroom, Luces said he couldn’t because he didn’t have his glasses. The judge allowed Luces to walk around the courtroom, but he still wasn’t able to pick out Van Dyke even though the former officer was wearing a bright yellow jail jumpsuit. Van Dyke has grown a bushy beard and mustache since he was convicted in October of second-degree murder and aggravated battery. A relative of Laquan McDonald has been allowed to read a victim impact statement from the slain black teen’s perspective, saying Chicago police officer Jason Van Dyke killed his grandnephew without provocation. Reading from a prepared text in the first person as Laquan McDonald on Friday, the Rev. Marvin Hunter said, “I am a 17-year-old boy” and “I am unable to speak in my own voice” because officer Jason Van Dyke “thought he would become judge, jury and executioner. Vidale Joy told the court Friday that Jason Van Dyke used a racial slur and put a gun to his head during a 2005 stop. He said Van Dyke “looked infuriated” and seemed “out of his mind.” Under cross examination, Joy conceded that he didn’t allege in his first accounts of the traffic stop that Van Dyke had used a slur. Witness Ed Nance wept as he testified that he hasn’t been the same since a 2007 stop. He says Van Dyke pulled him by the arms to the squad car while he was handcuffed and that he has undergone three surgeries to his shoulders as a result. He also says he has PTSD from the incident. Judge Vincent Gaughan’s decision on whether Jason Van Dyke’s second-degree murder or aggravated battery conviction is more serious will help determine the severity of the sentence. Judge Vincent Gaughan says he’ll first hear legal arguments about which is the more serious charge against Van Dyke, who was convicted of second-degree murder and 16 counts of aggravated battery — one for each time he shot McDonald. If he decides the murder charge is more serious, that could lead to a lesser sentence under a complex sentencing equation. A judge rejected allegations that the shocking video of Laquan McDonald’s death proved that police officers staged a cover-up in the fatal shooting of the black teen. Now another judge must decide how long the officer who pulled the trigger spends behind bars. Jason Van Dyke was convicted in October of second-degree murder and aggravated battery. He will likely be given prison time when he’s sentenced Friday. But critics of the police department who cheered Van Dyke’s conviction are worried after a judge on Thursday acquitted three officers accused of trying to conceal what happened to protect their colleague. He was the first Chicago officer found guilty in an on-duty shooting in a half century and probably the first ever in the shooting of an African-American.